African migrants arrive in Palermo after a successful rescue mission. Demotix/Antonio Melita. Some rights reserved. When discussing about the events of last week, there is a general consensus over the fact that yet another tragedy has unfolded at Lampedusa. However, in Italy, and to an extent in Europe itself, a point of contention looms over the cause of this tragedy. Conflicting narratives surface, troubling questions are raised: Do we casually attribute this loss to a cruel twist of fate, that couldn’t have been prevented, but only managed? Do we blame the conflict-ridden Libya, from whose shores unwanted migrants set sail for the promise of Europe? How do we deter the smugglers? Why do unwanted migrants want to come to Europe? Why can't they enter 'legally'? How can we stop them? Let’s begin with the facts. A boat with at least a hundred unauthorised migrants ('illegal' is perhaps a politically reductionist term), sailing towards Italy from the Libyan coast, requested help from the Italian authorities. Extreme weather was affecting the Sicilian channel, endangering the already desperate voyage. Due to waves of 8-10 metres and the harsh nautical winds, the open-deck patrol boats sent by Lampedusa had to cover 140 miles at a very slow pace. After the eighteen hours required for completing the rescue operation, the number of victims jumped from seven to twenty-nine. The cause was hypothermia, which struck twenty-two lives aboard the patrol boats. Those boats were in fact completely ill equipped for such a task, and didn’t have the basic resources for an adequate rescue. At the same time, two navy cruisers of the type previously used in rescue operations – under the “Mare Nostrum” initiative – were docked in Malta and Sicily for a restocking, and couldn’t intervene. Some of the survivors have signalled the presence of other two boats, with more than two hundred people aboard, currently dispersed. According to the last data from Save the Children, four boats left Libya on the 7th of February, each with roughly a hundred people on board. The EU Commissioner for Migration, Home Affairs and Citizenship Dimitris Avramopoulos, deeply regretting what happened in Lampedusa, tweeted the following: “The drama is ongoing. Our fight against smugglers continues in a relentless & coordinated way. More has to be done”. The message is clear – Italy is being forced to expropriate the crimes of exploitative smugglers on another continent. These smugglers, who are paid before the boats set sail, show no concern for the safety of their 'clients' once the transaction is complete. They often charge extra for the provision of a life jacket. If one is to acknowledge Italy's, if not Europe’s, limitations in directly inhibiting overseas smugglers, then it is reasonable to deduce that Italy can only stop these smugglers by deterring migrants from making these hazardous journeys in the first place. So, the suspicion that is raised is thus: do we neutralise smugglers by cutting demand? And if so, do we achieve this by abandoning migrants to what Shakespeare would have called 'the elements'? In other words: are we tempted to disown these migrants, so others think twice about jumping on an inflated boat towards the Sicilian coasts? The Italian Interior Minister Angelino Alfano has, until now, remained silent, while Prime Minister Matteo Renzi has promised he’ll ask Europe to increase its collective effort, whilst blaming yet another tragedy on Libya’s instability. It is unclear whether this 'collective effort' will be deployed in favour of migrants' plight, or against it. Others have prioritised the humanitarian concern: “I will never get used to pulling the blanket on the corpses of these poor people”, says the head of Lampedusa’s health department Dr. Pietro Bartolo. Together with the local staff involved in the rescue operations, Bartolo has blamed these events on “Triton”, the Frontex-coordinated operation for security in the Mediterranean. In addition, Lampedusa’s Mayor Giusi Nicolini and UNHCR spokesperson Carlotta Sami are tired of the ungrateful and lonesome task of pointing the finger at an inadequate system. “The 366 deaths of Lampedusa worth nothing, the Pope’s words worth nothing, we’re back to before Mare Nostrum. This is the reality", says Nicolini. The Mayor has been critical of Renzi’s and Alfano’s decision to abandon the rescue operation “Mare Nostrum”, which had been implemented in the aftermath of a tragedy on October 2013, in which 366 migrants died in a shipwreck. At the end of 2014, this navy operation, which according to some studies has saved 170,000 lives, has been discarded; Operation “Triton”, claimed to be substituting Mare Nostrum, in reality operates with only a third of the original budget allocated for rescue and humanitarian missions, and counts an overall personnel of 65. In a manoeuvre that can best be described as a Europe-wide curling-into-the-foetal-position, the patrolling line has been shifted back to “30 miles from the Italian coasts”. With Mare Nostrum, the navy ships reached out, if required, almost all the way to the Libyan waters. Now, thanks to Triton, they’re only allowed to search Italy's doorstep. As we have seen, this unloads the task of rescuing on the local navy personnel, whose patrol boats, often open-decked, don’t have sufficient capacity to carry out adequate operations. Although better than Triton, Mare Nostrum wasn’t adequate either. Lampedusa's mayor joins many local and national NGOs in the demand for the immediate opening of a secure and legal channel for migrants to enter Europe. She goes further to say that this should be sided with a joint effort to provide assistance to those migrants in Libya, which tends to be the first point of arrival for many migrants. This proposal stems from a very simple observation: regardless of the circumstances, people will keep coming. And it is the predictability of these tragedies, and Italy’s ultimate hypocrisy, that brings Gino Strada, founder of “Emergency”, to declare that he’s “ashamed of being Italian”. These tragedies, he claims, are predictable; since it’s clear that they would keep happening, measures should be implemented accordingly. “This is not an accident in which an idiot captain of a cruise ship capsizes, these are accidents that keep happening, where we lose hundreds of people at a time” – he concludes, referring to the Costa Concordia shipwreck. Paradoxically, the pledged contribution of all the European member states to the new mission has been shrinking budgets and an overall diminished capacity. Europe’s attitude towards this crisis is no longer concerned with the humanitarian aspect, but it’s rather obsessed with the issue of cheap securitisation of its southern borders. The rest is left to the charitable effort of single states. Thus, an increasing section of the population perceives the emergency of migration, and the moral obligation of humanitarian assistance as a burden left solely on Italian shoulders; at the same time, the constant politics of budget cuts is slicing thin the very spirit of European solidarity. The justifications raised by the UK for opting out of participation in rescue operations seems to be shared amongst the European Commission, and it has become the rationale for the Triton operation: a consistent budget support for rescue operations in the Mediterranean could provide false hopes for migrants, and hence encourage them to take risks in order to reach Europe. The reduced assistance should thus disenfranchise thousands of refugees to try and make it to Europe – where they might usurp the UK citizens’ right to bid £210,000 on a bronze statue of Margaret Thatcher. However, regardless of the twisted rationality employed to legitimise this decision, two aspects of Europe’s moral attitude towards this “emergency” have been revealed in the aftermath of this umpteenth disaster. 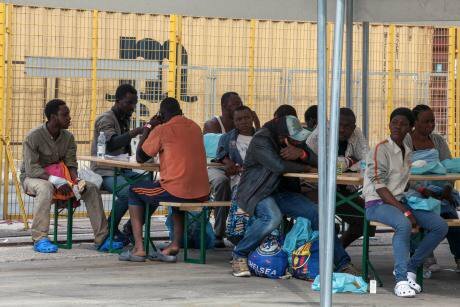 Federica Mogherini has recently called for a European meeting to re-discuss the policies, and strengthen the measures against human trafficking and smuggling, in an attempt at preventing these terrible accidents to happen again. In the political discourse, it’s implied an understanding of these events as unfortunate tragedies. Even the Italian Church, which has repeatedly condemned Europe’s inhospitality, pleads for a more effective intervention from Brussels. This apparently clear-cut analysis of the issues at stake in the Mediterranean offers an over-simplified narrative of desperate people falling in the trap of smugglers to reach a dream-like safe heaven. In line with the core of European rationale, legality needs to be enforced in all respects, from economic austerity to the control of its borders. Thus, migrants who agree to pay traffickers and attempt to reach Europe not through the “legal” channels are guilty until proven innocents. Their motivations and desires belong to the Libyan shores, while Europe’s charitable spirit is summoned only in the tragic event of a shipwreck, possibly not too far from the coast. Ultimately, in fact, an accident cannot be prevented, but only dealt with symptomatically. Secondly, Europe’s almighty power over concession and protection of migrants’ human rights is now transferred onto the aseptic, invisible, and thus impersonal sea-border. By denying support beyond its own borders, the moral duty of assistance becomes externalised, belonging now to the sphere of destiny, fate or providence. The sense of omnipotence deriving from the appropriation of “the right to decide on others’ rights” unmasks Europe’s petty sense of superiority. A line is drawn in the Mediterranean waters, between those deserving to enjoy the collective fiction of universal rights, and those who are wrecked a little too far from our charitable reach.